Storage system architectures are moving away from monolithic scale-up approaches and adopting scale-out storage – providing a powerful and flexible way to respond to the inevitable data growth and data management challenges in today’s environments. With extensive data growth demands, there needs to be an increase in the levels of storage and application availability, performance, and scalability. 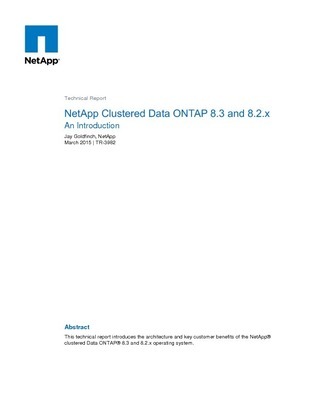 Access this technical report that provides an overview of NetApp clustered Data ONTAP 8.3 and 8.2x and shows how it incorporates industry-leading unified architecture, non-disruptive operations, proven storage efficiency, and seamless scalability.